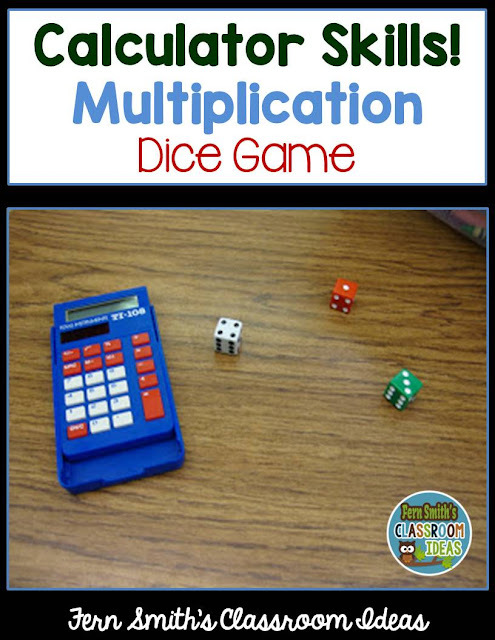 Quick and Easy to Prep Dice Game for Multiplication or Addition of Three Digits - Fern Smith's Classroom Ideas! You will ♥love♥ this game! I made it up one year because my plan lesson ended sooner than I thought & the natives were getting restless, they loved it SOOOOO much that we turned it into a tournament the next day! The best part about the game is that it is completely LUCK, so your lowest student can be the grand prize winner and your smartest of the smart might end up in last place! However, it is great for reinforcing multiplication and calculator skills for everyone. It can also be revised to be addition instead, so it is really a great K - 4th game! Pair students up, or let them pick partners. Everyone gets 3 dice each and their own calculator. Students roll all three dice at the same time. Each child multiplies their 3 digits to get a final answer. The winner is the student with the highest answer. Record your tallies on a sheet of paper. Play until one student gets 10 points. This also helps with the mental math of "three to go and I win" or "I only need 1 point to tie" etc. Then congratulate your winner, "Great Job!" Say something nice to the loser, "Good Game!" Move around the room and watch another game until someone is done, then play a new partner! Then, like real life, we figure out some better ways to control the dice. One child said, "After you roll the dice, put them in the cover of the calculator!" This game made for some great discussion at the end of class. How rolling a 1 stinks because anything times 1 "says their name" and stays the same. How the greatest answer is 216 because 6*6*6= 216. They thought of lots of interesting things & I wish I had taken a picture of the anchor chart with their stickie notes! Anyway, the next day we played it like a basketball tournament. Winners continued to play each other and losers moved on to play each other...it was a lot of fun! True to what I had hoped, the lowest student in the class was the WINNER! The loser? I had said that the smartest of the smart could be the loser because it is completely a game of LUCK! Number 12, the bottom of the heap was ME! I lost the entire game & not because I wasn't trying!